Thunderstorms could cause hail and gusty wind on Thursday. Here is an updated forecast from the WBRZ Weather Team. The risk for severe weather on Thursday continues to increase. The National Weather Service Storm Prediction Center (SPC) has issued a “Day 3 Convective Outlook” highlighting the WBRZ Weather forecast area with a “slight risk” (2/5) for severe weather. The latest analysis suggests a potentially stronger and more widespread event than last Saturday. Large hail, damaging wind and heavy rain are the early frontrunners for main threats. As of Tuesday Morning, forecast models were indicating several factors that support large hail such as a low freezing level, high instability and strong upper level winds. A strong wind field overall but less rotation in the atmosphere would make damaging wind more likely than tornadoes. These ingredients align with radar simulations to bring the most likely time for action during the second half of Thursday. Keep in mind that two days out, specific threats and timing could possibly change. This storm system is the third in a series of four (last Saturday, last Monday) to affect the central Gulf Coast. Another is pegged for the end of the weekend. The active pattern serves as a reminder to stay weather aware, check the forecast and make sure you and loved ones are ready for severe storms. CLICK HERE to review severe weather and your preparedness plan. The WBRZ Weather team is committed to keeping you safe and ahead of the storm. 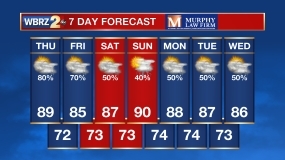 Even if forecasts change for better or worse, the WBRZ Weather Team will bring you the latest. Updates can be found on wbrz.com, Facebook, Twitter and the free WBRZ WX App. for Apple and Android.